The Human Torch’s girlfriend Frankie Raye turns out to be the daughter of Phineas Horton, the creator of the 1940s Human Torch, and have the same flame powers. The Inhumans relocate Attilan from the Himalayas to the Moon. Luna is born to Quicksilver and Crystal. Terrax rebels against Galactus, who is then defeated by the Fantastic Four, the Avengers and Dr. Strange. Reed saves Galactus’ life, as Frankie Raye volunteers to be Galactus’ new herald, Nova. Dr. Doom regains the throne of Latveria from Zorba, and befriends the orphan boy Kristoff. The Sandman quits crime and has a beer with Ben Grimm. The Impossible Man and his mate have children. Machine Man becomes attached to Jocasta when they aid Ben Grimm against Ultron. The Thing stands as Earth's greatest fighter against the Champion, an Elder of the Universe obsessed with 1-on-1 boxing. Ka-Zar and Shanna O'Hara explore the original Dante's Inferno and encounter the 700-year old sorcerer Belasco. Spider-Man and the X-Men battle the Savage Land Mutates (including Vertigo). The X-Men and the Starjammers encounter the Brood who, with Deathbird, attempt to usurp Lilandra’s rule of the Shi-ar Empire. Storm is bitten by Dracula and falls under his influence. Lilith manipulates the X-Men and Rachel van Helsing into seemingly destroying Dracula. Rachel has Wolverine kill her when she becomes a vampire. While fighting Belasco, Colossus' sister Illyana is stuck in limbo for 7 years, but returns only moments after her departure. Brood experiments on her DNA turn Carol Danvers into the energy-controlling Binary. The X-Men and Magneto join forces to battle the anti-mutant evangelist Rev. William Stryker. The X-Men and the (New) Teen Titans battle Darkseid and an avatar of Dark Phoenix created by the Source. Professor Xavier (believing the X-Men dead due to their capture by the Brood) begins training a group of “New Mutants” comprised of Cannonball, Sunspot, Wolfsbane, Karma, and Psyche. Kitty Pryde befriends Lockheed, a small alien dragon, while battling the Brood. Wolverine and the ninja Yukio battle the Hand in Japan, after which Wolverine becomes (briefly) engaged to Mariko Yashida. Spider-Man and the Black Cat date for a short time. With Professor Xavier's help, Spider-Man defeats the right-wing extremist villain Professor Power. Spider-Man encounters a now-aged Dominic Fortune at Aunt May's rest home. Bullseye kills Elektra for taking his place as the Kingpin’s assassin. In return, Daredevil paralyzes him. Daredevil meets the Punisher for the first time. While Daredevil's senses are crippled from an explosion, the Black Widow returns. During an attack by the Hand Stick dies, but Elektra is somehow resurrected by Daredevil and one of Stick's followers. Iron Man faces Obadiah Stane's Chessmen. Tony Stark begins a romance with the mysterious Indries Moomji. The Krylorian filmmaker, Bereet, decides to make a documentary on the Hulk. The Hulk encounters Rocket Raccoon, now a guardian of the Keystone Quadrant. After an overdose of Gamma radiation, Bruce Banner retains his consciousness while as the Hulk. The Hulk is given amnesty for his crimes by the President. Captain America teams with the men who replaced him while frozen (Spirit of '76, the Patriot, '50s Cap) to free an alternate Earth. At a bike show, Cap encounters the mutant group Team America. When Loki and Tyr organize a rebellion in Asgard and steal the Apples of Idunn, Odin and the other gods are forced to flee to Earth. The Apples are liberated after Thor defeats the Midgard Serpent. The Grandmaster and Death play a Contest of Champions for the life of the Grandmasters fellow elder, the Collector. New heroes, including the Collective Man, Le Peregrine, Shamrock, and Blitzkrieg participate. Captain Mar-vell dies of cancer caused by radiation exposure during a prior battle with Nitro. Nighthawk sacrifices his life while preventing a secret right-wing cabal from killing all of Russia. Nebulon dies in battle with the Avengers and the Defenders. Dr. Strange travels to Egypt in the ancient past and aids the Fantastic Four against Rama-Tut. Clea decides to leave Dr. Strange and returns to the Dark Dimension. Tigra defeats the Molecule Man by convincing him to seek therapy, but decides to leave the Avengers. Moondragon kills her father, Drax the Destroyer. The She-Hulk joins the Avengers (and Hawkeye returns). Tony Stark flirts with the Wasp while Hank Pym is in prison. 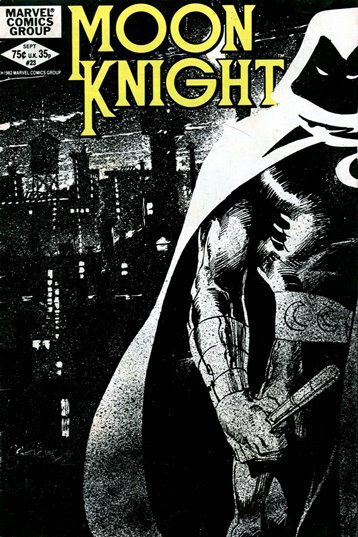 The Black Knight returns to the present after saving Avalon from alien gods the Fomor. Monica Rambeau gets energy-powers after being caught in an exploding inter-dimensional gateway and takes the name Captain Marvel. Moon Knight stops Black Spectre from becoming mayor. Shang-Chi prevents the Russian assassin Ghost Maker from killing the Queen of England. Shang-Chi returns to China to face his father Fu Manchu one last time. He fights a clone copy of himself. A power-mad Prince Argon sends Huntarr, an artificially created living weapon (and future ally), after the Micronauts. Microtron and Nanotron sacrifice their consciousness so that Biotron can live again in a new spaceship-sized body. When Galactus attempts to consume Galador, ROM sends him to the Dark Wraiths' home, the Dark Nebula, which he finds unappetizing. Hercules attempts to get Galactus drunk in order to prevent him from consuming a planet.